Jimmy Clewes comes to us from the UK just south of Scotland. 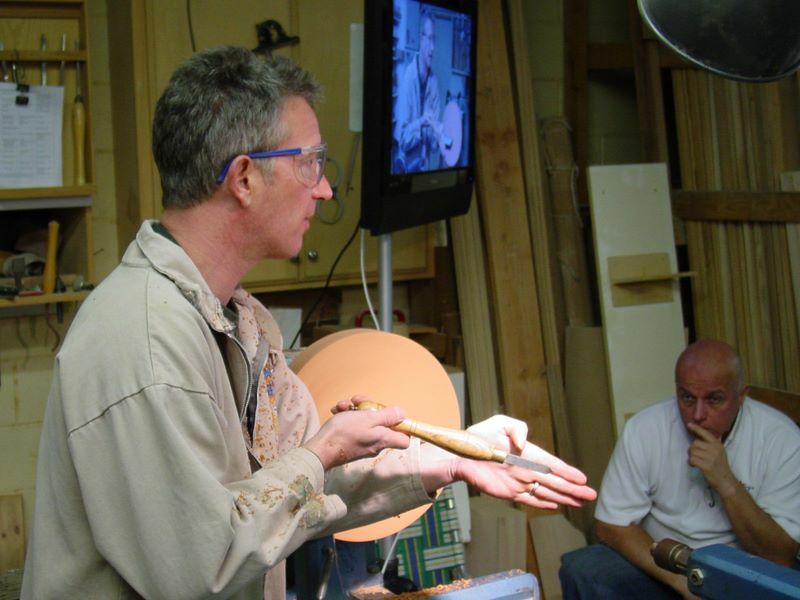 Jimmy gives demos and classes all over the world and is a featured teacher at the Craft School in Provo, UT. 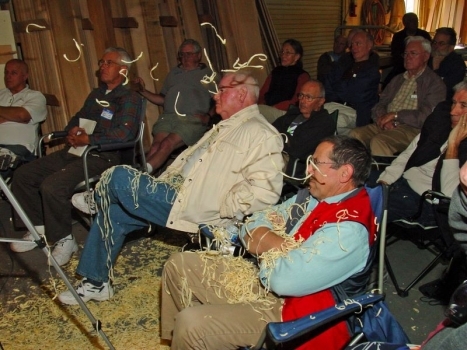 He was named the woodturning director at “Canyon Studios” which is a new school in a suburb of Dallas, TX. 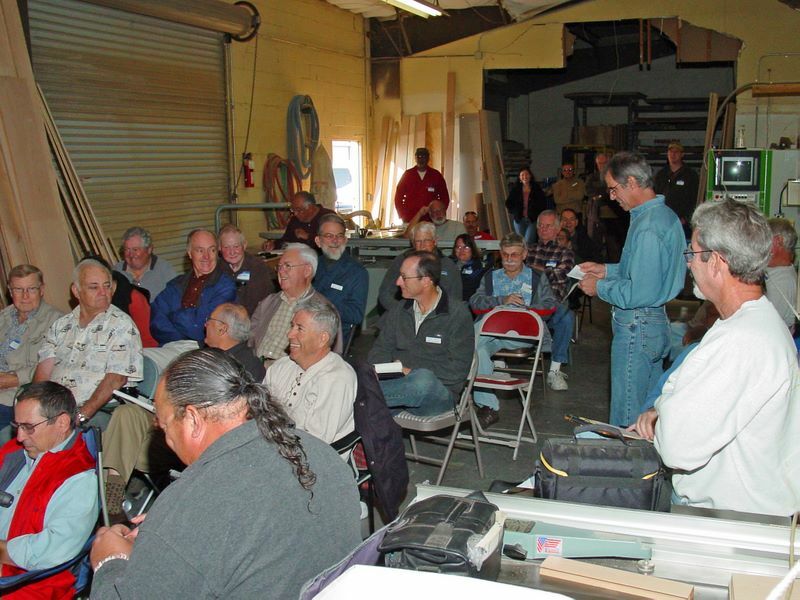 You can get info about the school and classes at www.canyonstudios.org. Also you can see Jimmy’s work at his website www.jimmyclewes.com. Our club library has many of his DVDs. Jimmy gained his understanding of wood as a tree surgeon and also has formal training in engineering, furniture building and design, plus over 20 years of woodturning experience. 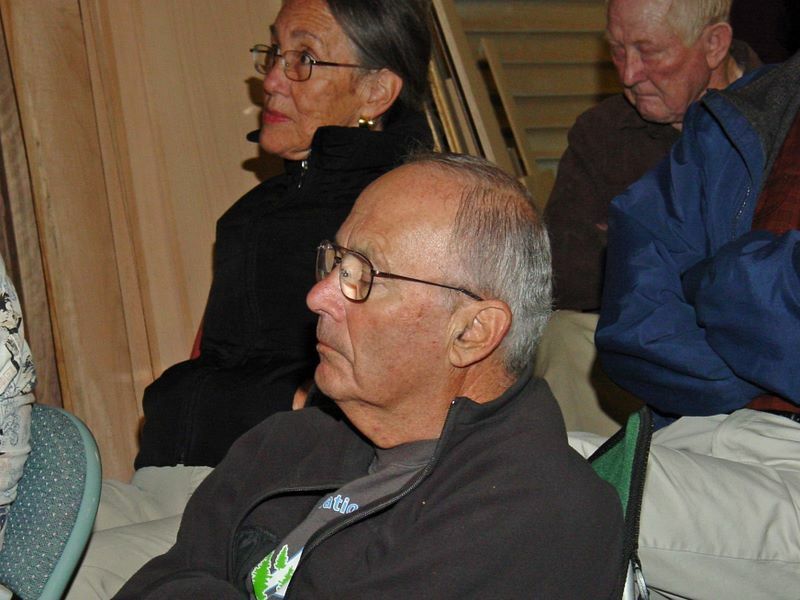 Jimmy demonstrated for us in October 2007 and the event was very well attended. Click here to see the write-up and photos from 2007. For this all-day special demo RESERVATIONS are necessary. If you plan to attend email your reservation immediately to Ron Lindsay at RSVP@channelislandswoodturners.organd mail your check to him: $35 for members and $45 for guests by November 11. After that date if there is still room neighboring clubs will be invited to attend. Lunch is included. Minutes of the meeting held 24 October may be viewed by clicking here. 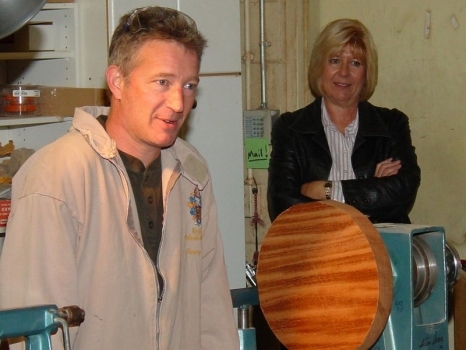 The Channel Islands Woodturners will hold their 2010 Board election at our November meeting. All paid members in attendance are eligible to vote. Saturday, 5 December, will be the Holiday Party at Al and Lynn Geller’s home. Jimmy began his demo indicating that there are many ways to turn wood, many tool grinds, techniques, etc. He showed us his way and said to try it out and see if it worked for us. Use whatever tool that will do what you want to do. Use a scraper when it is required. He said a specific angle tool grind is not critical. 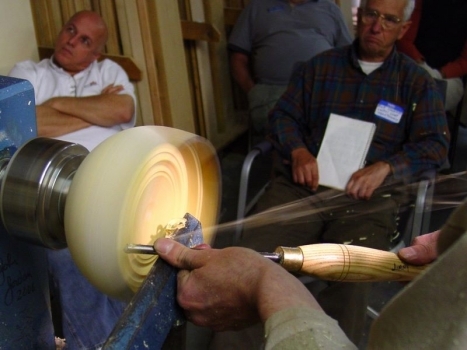 A deeper fluted bowl gouge is safer than a shallow spindle gouge in order to avoid catches. 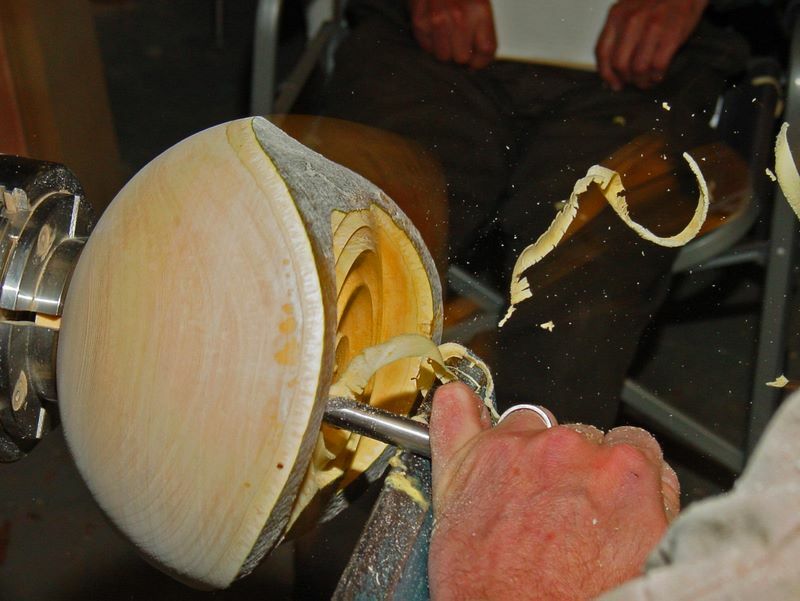 He used a jig to sharpen his gouges and recommends that we all use one. 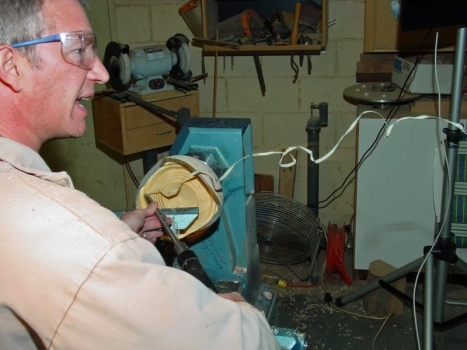 He uses a diamond credit card sized hone to touch up the gouges between grinds. He does not hone his gouges directly off the grinder. 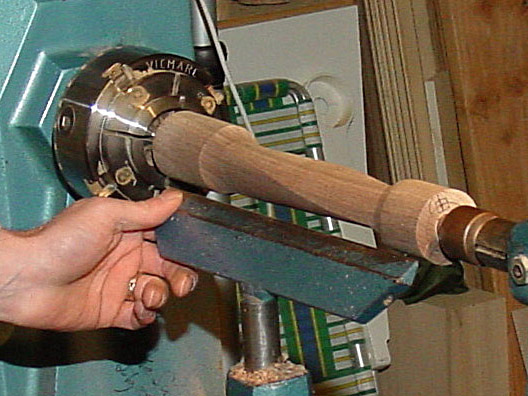 He grinds his scrapers upside down so the grinding wheel will pull the burr off the tool edge. 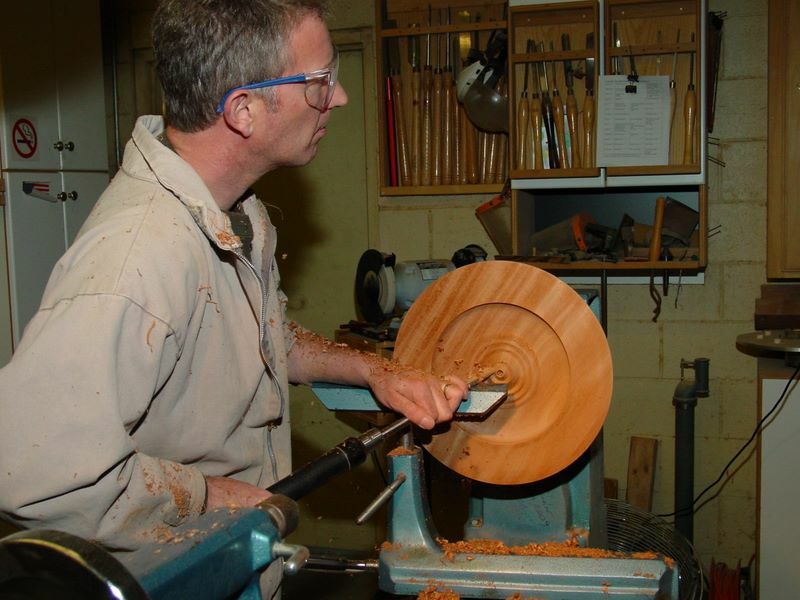 Jimmy used seven tools to do all the turning – 1/2” (bar size) bowl gouge, 3/8” bowl gouge, 3/8” spindle gouge. All these tools had a fingernail grind with about a 45 degree grind angle. He also used a 3/8” bowl gouge with a short circular grind, a 1-1/4” spindle roughing gouge and two 1/16” wide parting tools. One of the parting tool tips was shaped to produce a dovetail recess for dovetail jaws on a scroll chuck. He favored having the end of the tool handle being braced by his hip to help stabilize the tool. He is right handed, so his left hand was at the tool rest, holding the gouge to the rest, and the right hand was on the handle near the ferrule. The flute was at 45 degrees off vertical (1:30 or 10:30 o’clock), and the gouge sloped up at about 30 degrees. The right arm was slightly bent at the elbow and the shoulders were relaxed and level. The hand grip was firm but not tense. His body moved in and out for straight cuts or swung in an arc for circular cuts. All cuts occurred at lathe centerline height. Use as fast a lathe speed as you are comfortable with. 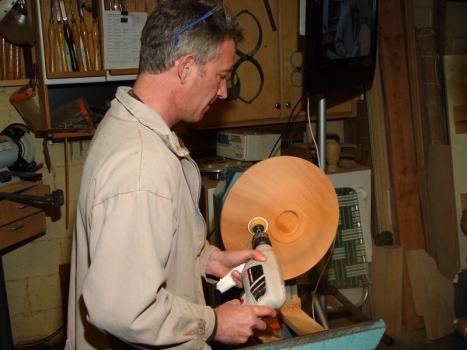 A faster lathe speed results in smoother cuts and less effort in removing wood. 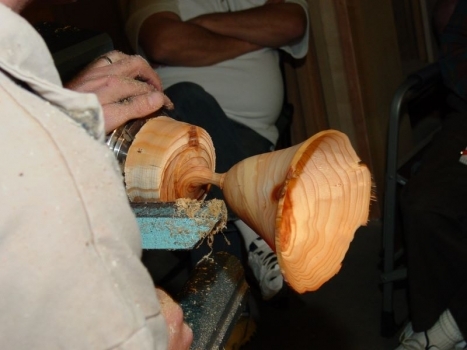 A “pull” cut (or “peeling or “draw” cut) will remove wood quickly. 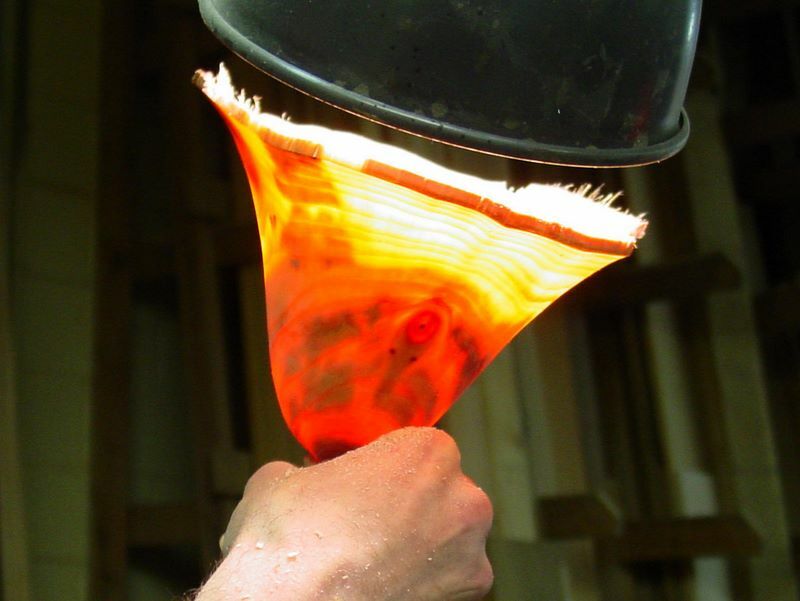 The gouge wing is presented to the wood at approximately 45 degrees. The longer the gouge wing contact or the more the tool is forced into the wood, the faster the removal. A push cut is used for final cuts to achieve the best cut with minimum tear out. The bevel rubs or gently touches the wood to get the best results. 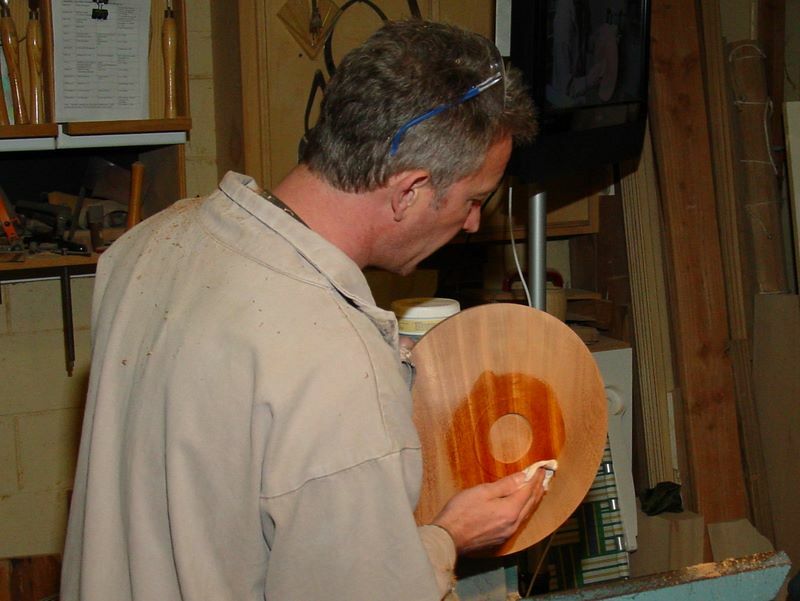 He preferred to use the 3/8” bowl gouge for finishing cuts so that he could better feel the wood surface. 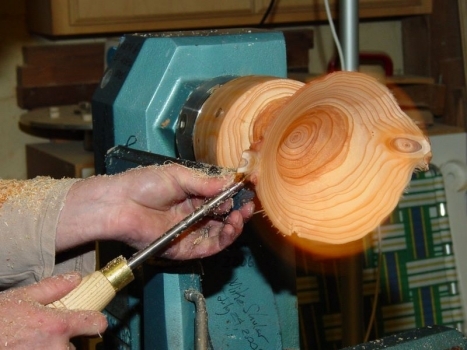 To maintain wood rigidity, cut the bowl interior in stages and leave the wood in the center until the end. 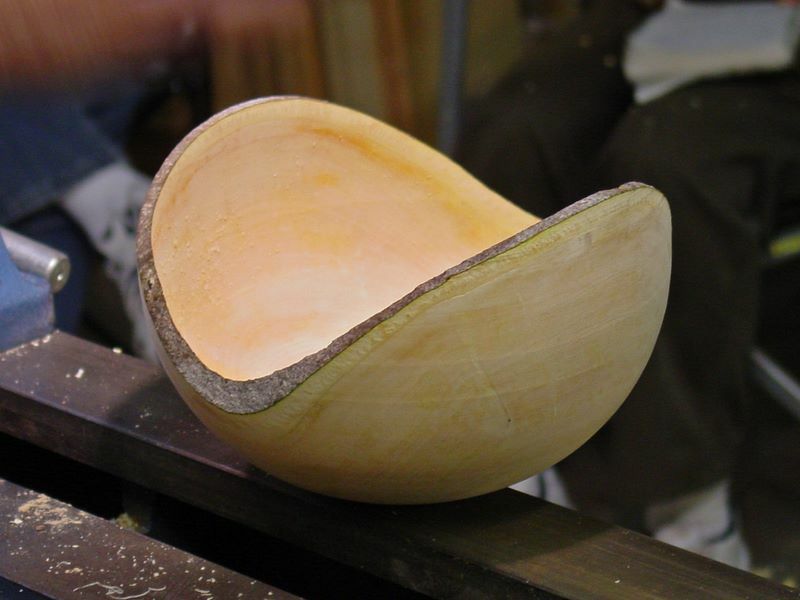 Completely cut the upper portion of the bowl interior to final thickness prior to removing more wood inside the bowl. Keep the tool rest as close as possible to the piece to reduce the amount of tool overhang. 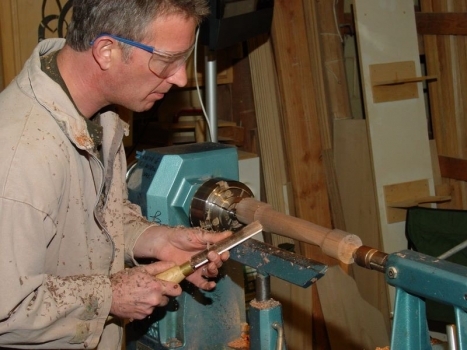 Do a dry run to insure that the tool rest is in the right position, especially when doing pull cuts. When fairing in final cuts on a bowl, use a back and forth motion to eliminate a “step” at the beginning of a cut.Maintain the finishing cut depth when you can’t see the cut in profile. 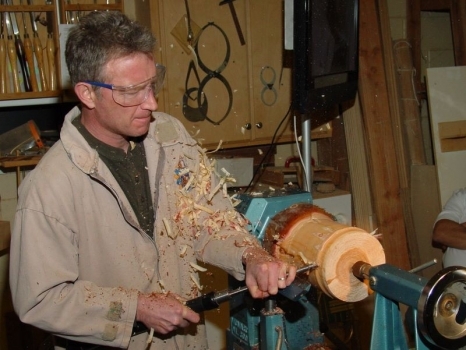 He prefers to use the scroll chuck in the expansion mode.He uses a 1/8” or deeper recess that is just slightly larger in diameter than the scroll chuck jaws when the jaws are completely closed.When the jaws are expanded in the recess, he obtained nearly a completely consistent contact surface of the wood and jaws. 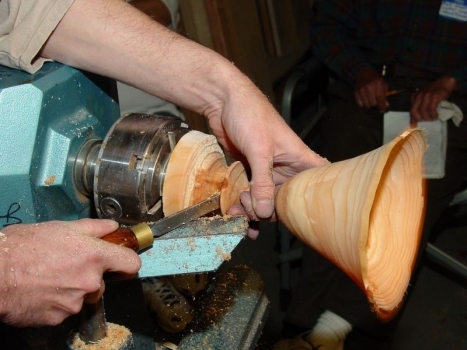 When he gripped a tenon in compression, the jaws were nearly completely closed. He liked the Oneway screw chuck and thought it was very heavy and well made.He also used the Stebcenter spur drive by Sorby and Penn State. He felt that M-2 steel tools are OK and that specialty steels were not required. Always start the lathe slowly when mounting material on a chuck or between centers. 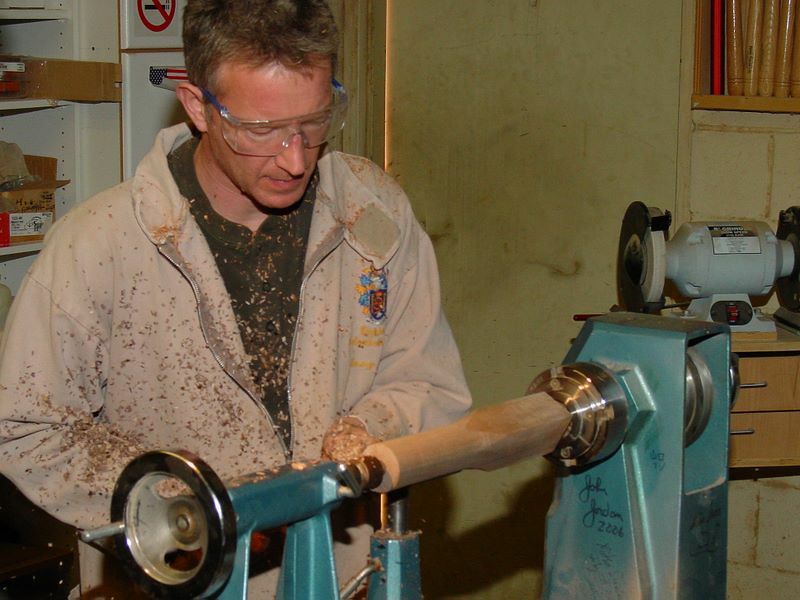 Sand wood at a slow lathe speed (300-400 RPM) to reduce heating up the wood and causing heat checks. PLATTER – 12” diameter, 1.5” thick. 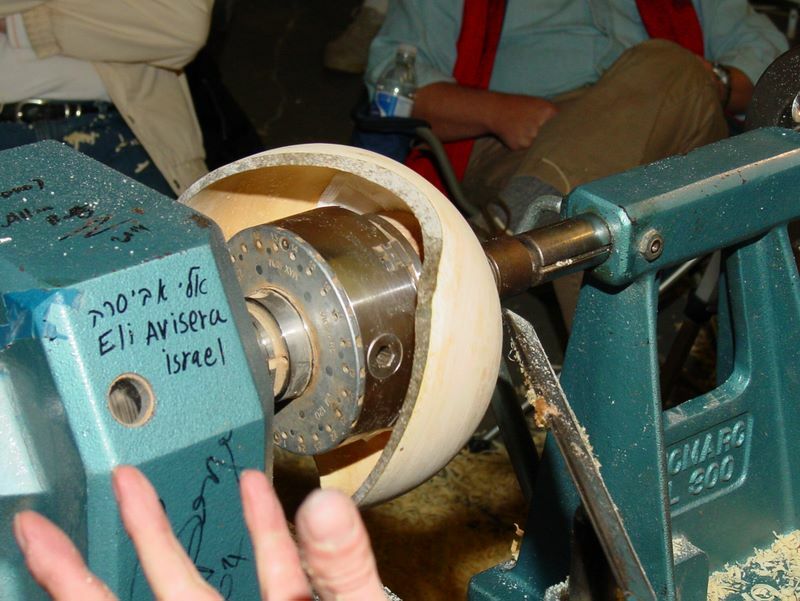 The blank was sawed round on the band saw and mounted on a screw held in a 4-jaw scroll chuck (Oneway screw chuck). 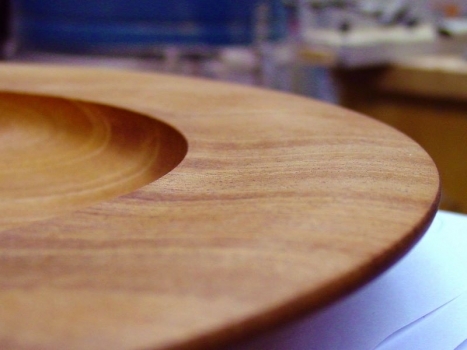 Put the nicest grain pattern at the bottom of the platter. After facing off the bottom and edge of the blank, Jimmy used dividers to mark out the internal recess for the scroll chuck. The diameter of the recess is about 1/8” larger than the closed jaw diameter. Depth was approximately 1/8” and cleanly made with the specially ground parting tool. 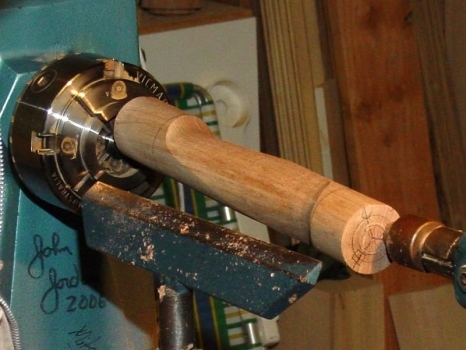 The balance of the wood within the recess was removed with a 3/8” bowl gouge. Leave a wide rim foot so that there is adequate wood around the chucking recess. 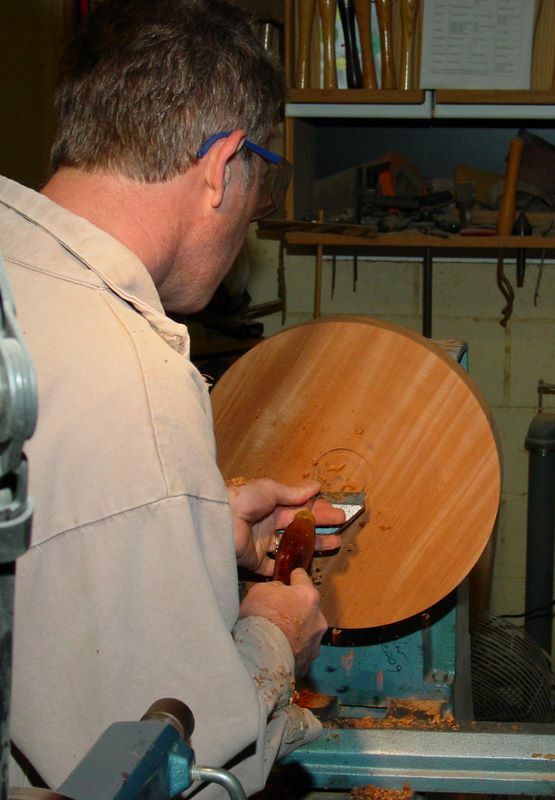 Jimmy cut an ogee curve from base to top, leaving about 1/4” thickness at the rim. The ogee surface must be a continuous curve without any flat spots. Stop the lathe often and check the shape. Feel the curve and get it right. Shear scrape the surface with the gouge at 45 degrees to the vertical to obtain the best profile and then do a final pass with a 3/8” bowl gouge using a push cut taking off as little material as possible. Remount the foot on the scroll chuck in the expansion mode. Refine the bottom ogee as required. 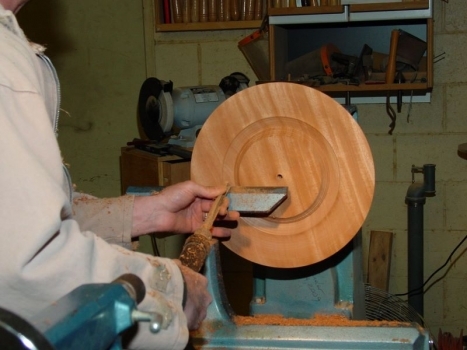 Turn a small shallow ogee shaped rim on the top of the bowl. This top ogee is related to the ogee on the bottom of the platter. The platter edge was rounded so that the surfaces were continuous from the foot all the way to the platter sharp entry opening. 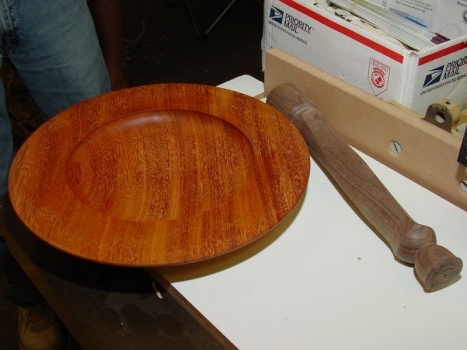 He cut the platter interior in a continuous curve with a flat bottom. Take time and check for tear out or disturbed grain. Power sand to remove all tool marks, torn grain, etc. 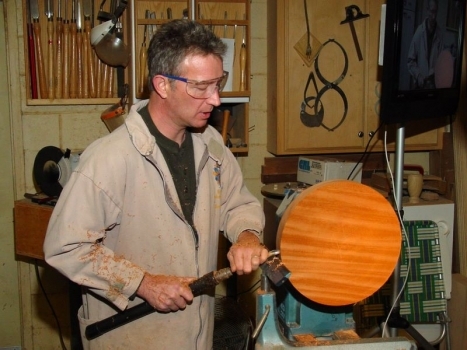 Jimmy then hand sanded up through the grits and applied a shellac sanding sealer (30% de-waxed blond shellac flakes with 70% denatured alcohol — leave overnight to dissolve the flakes). Apply with a paper towel, lightly sand, and add your standard finish or wax. Do not use the shellac for food use since water may get under the shellac and lift it. 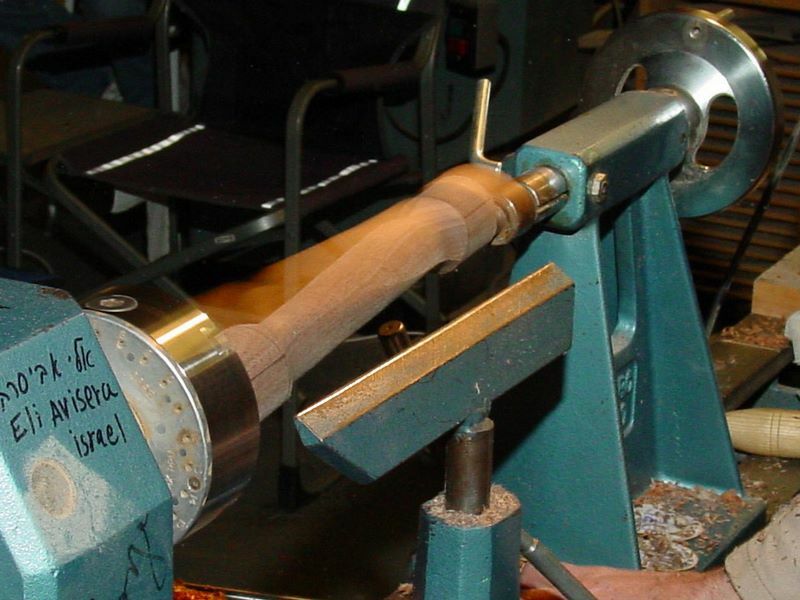 Mount a spindle blank between centers and make a uniform cylinder with a spindle roughing gouge. 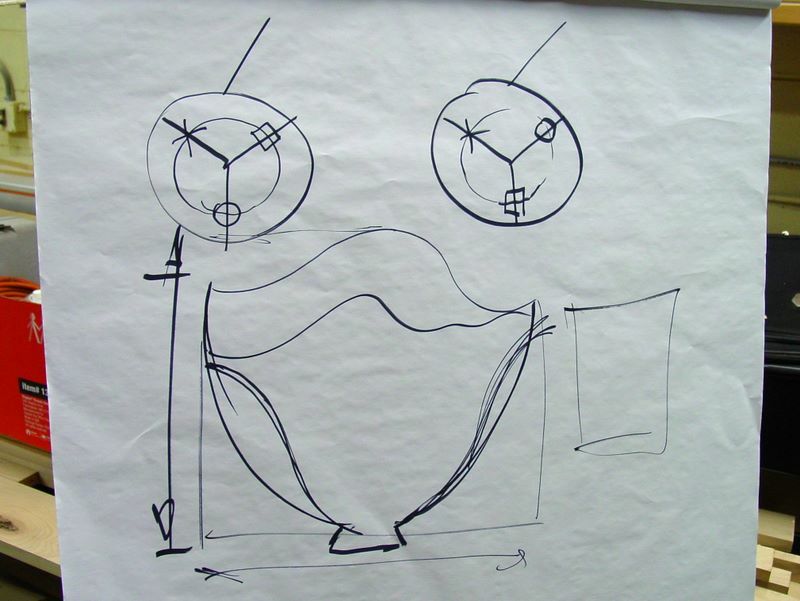 Clean up blank ends, divide ends into 120 degree sections as shown in the photo of his drawing. The “center” circle is drawn with a compass or marked with a pencil with the lathe turning. 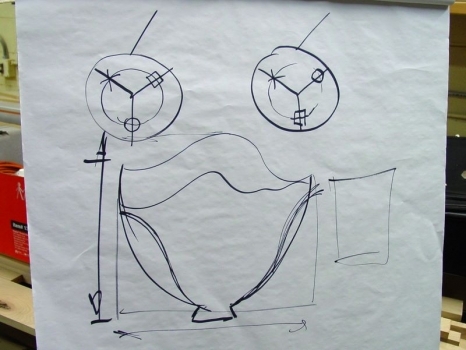 The circle should be as large as possible and still be able to safely attach a drive center. The three new centers occur at the intersection of the 120 degree divisions and the “center” circle. The relationship is important. One set of centers is similar for each end and two are switched. This will result in all the centers rotating around the axis. Mount the blank at centers o-o, then x-x, then □-□. Jimmy used a 1/2” diameter Sorby Stebcentre for a drive center (Penn State sells a 5/8” version) . He used a bowl gouge to start the cuts at each end. 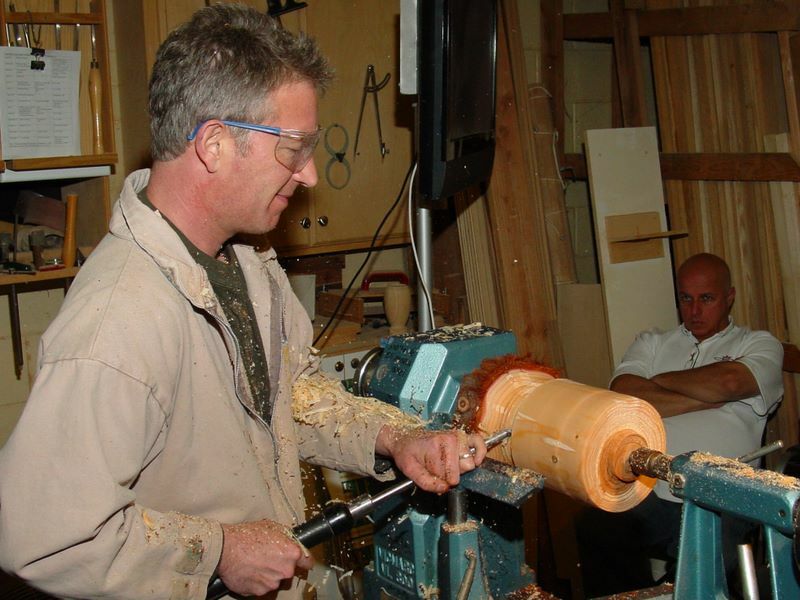 He then used the spindle roughing gouge to remove the wood between the entry cuts and to clean up the entry cuts. 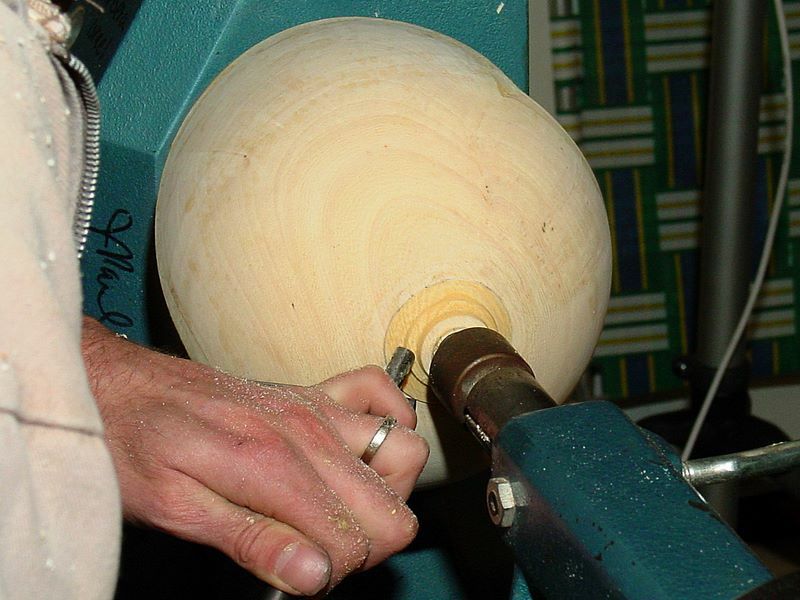 Once the blank was uniformly cut between the entry cuts, he remounted the blank to another set of center points and repeated making the entry cuts, etc. The critical task was to make the same depth of cut at each set of centers. The number of twisted segments is unlimited. Jimmy uses six segments for box making. 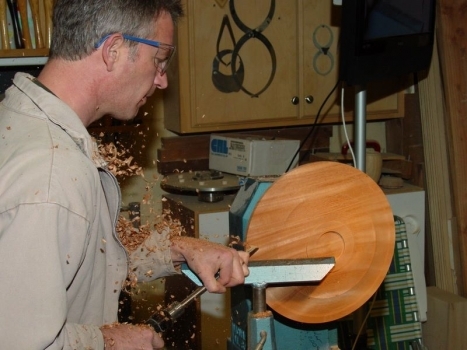 Be careful when sanding so that you do not lose the sharp intersection lines. 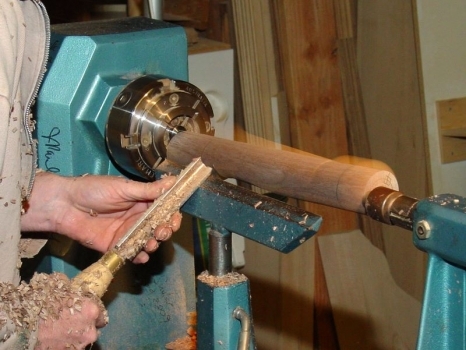 Mount the blank between centers with the grain along the lathe axis. 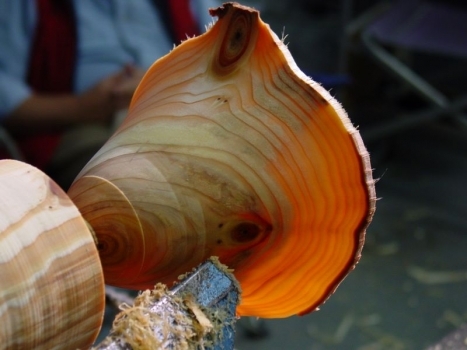 Make a series of V cuts with a bowl gouge to safely remove the fibrous Redwood bark. Then use a bowl gouge with a pull cut to remove the wood between the V cuts. Cut the end square and make a dovetail tenon for the scroll chuck. Shape the outside of the vase with a bowl gouge. 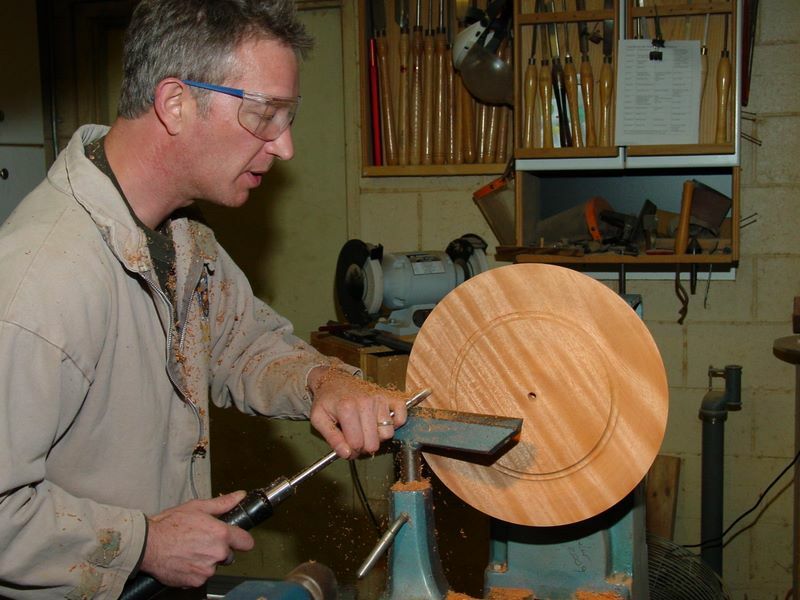 Remount the blank in the scroll chuck and if necessary true up the base exterior shape. Jimmy left the bottom temporarily thick for stability. 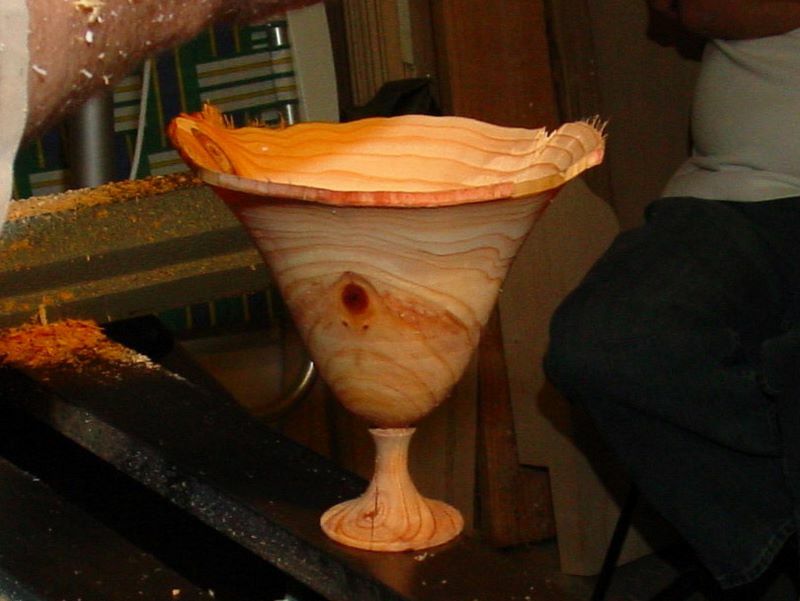 Cut the interior of the vase in stages. 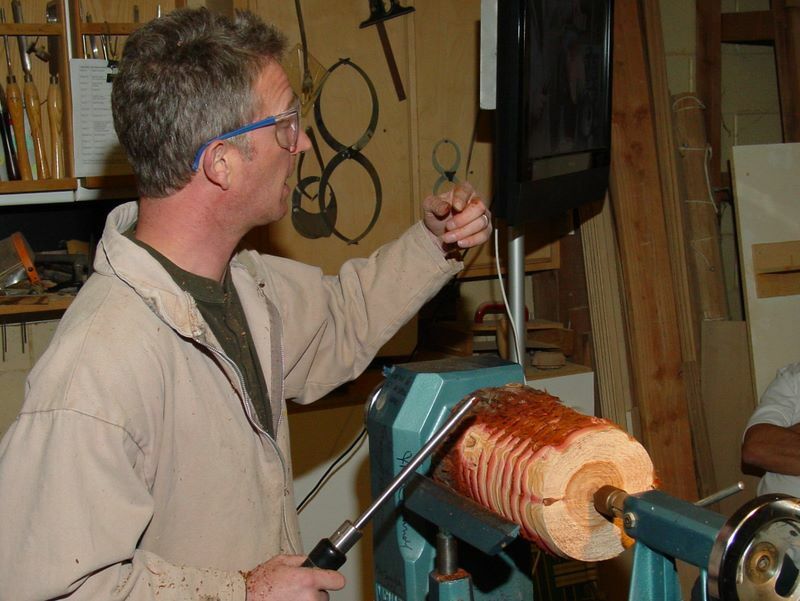 Jimmy used the Rolly Monro Mini Hollower tool to take out most of the wood. 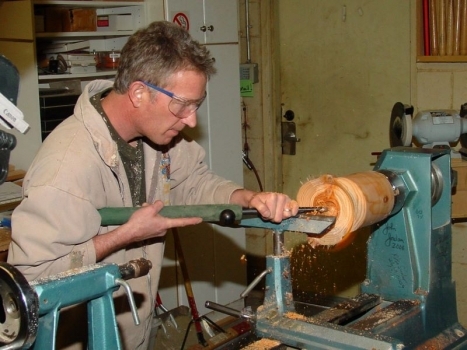 The tool is held so that it slopes “downhill” like a scraper and he cut the wood at lathe centerline. Use it for cutting end grain green wood. He left a thick wall. 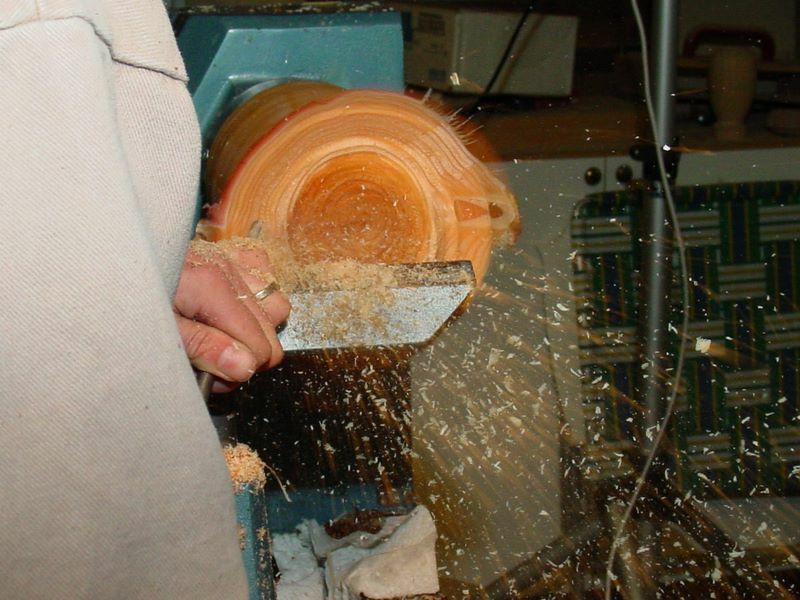 He then used bowl gouges to refine and finish the vase interior, cutting from top lip to the bottom (against the grain). A flatter ground (more obtuse angle) bowl gouge will be needed at the bottom to ride the bevel unless the vase has a large opening. After the interior is cut and sanded, use a bowl gouge on the exterior to reduce the wall thickness, following the interior vase surface. Check the thickness as you go down to the base. He turned a pointy bead at the base with a spindle gouge. The foot diameter was the same size as the vase was 1/3 up from the bottom of the vase. Make the foot thickness the same as the vase wall thickness. Mount blank between centers with the grain perpendicular the lathe axis and turn the outer surface round. Cut a tenon for the base at the tailstock end. Shape the bowl exterior. Use the bowl gouge with a pull cut to quickly remove excess wood. Jimmy established the bowl’s maximum diameter at the upper 2/3 of the height of the bowl. Complete the outer shape using a push cut from base to lip. Wet sand bowl exterior. Remount bowl on scroll chuck. 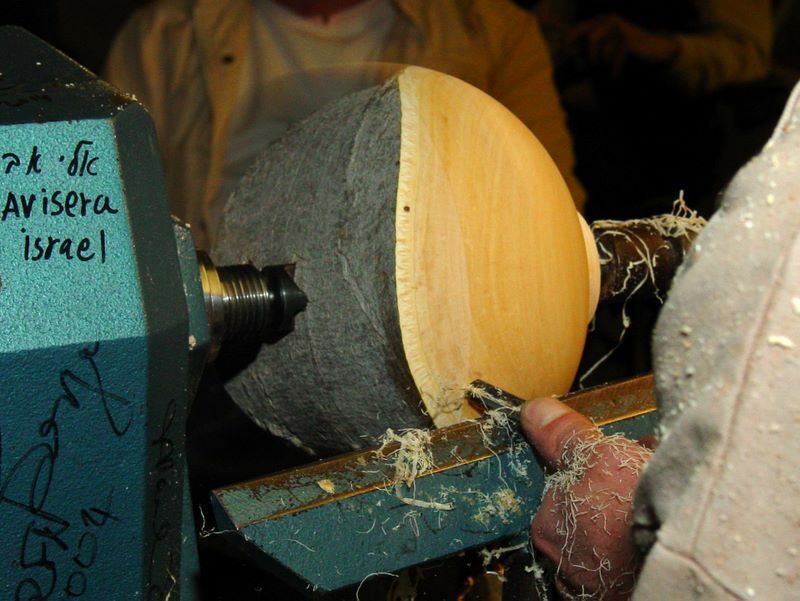 Start removing interior wood in small step cuts to get access to the bowl wings. 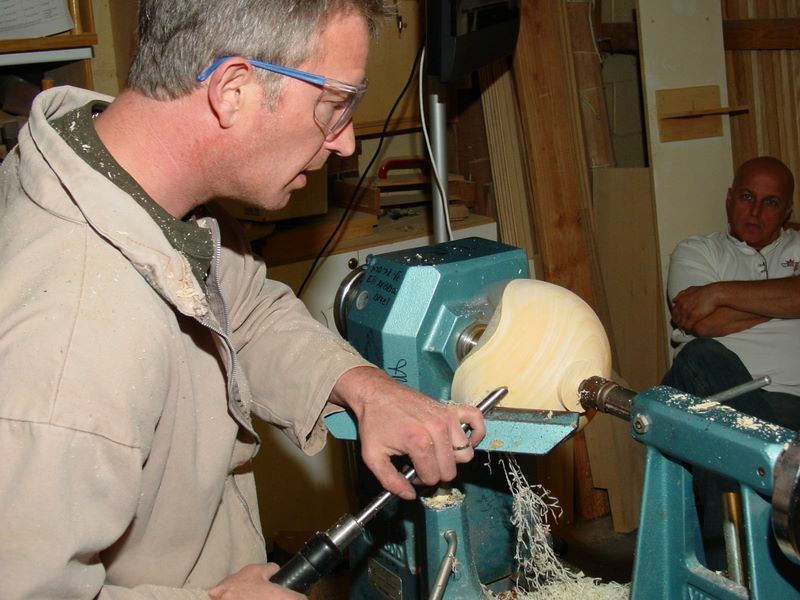 Use a 3/8” bowl gouge to cut bowl interior surface. Avoid cutting the interior surface in short segments since it is easy to produce flat steps. Cut in a continuous motion to complete the upper wings. 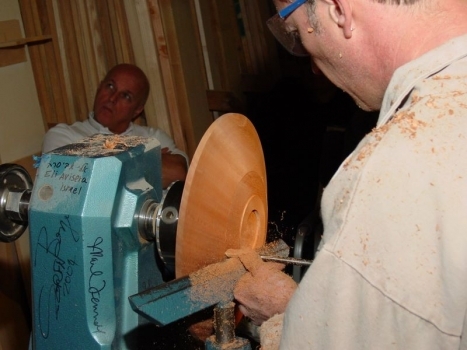 Remove more interior wood to determine the bottom of the bowl. Start removing the balance of the interior and cut a circular arc aiming for the bottom of the bowl. Regrind the bowl gouge as required to rub the bevel to the bottom of the bowl (or use a gouge with a more obtuse angle). Moisten the wood as required to replace water lost in turning in order to prevent warping during turning. 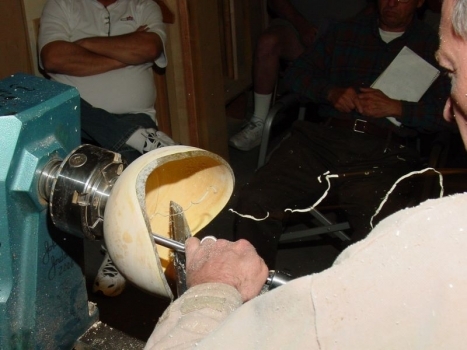 Remount the bowl on a jam chuck and finish turn the bottom of the bowl. 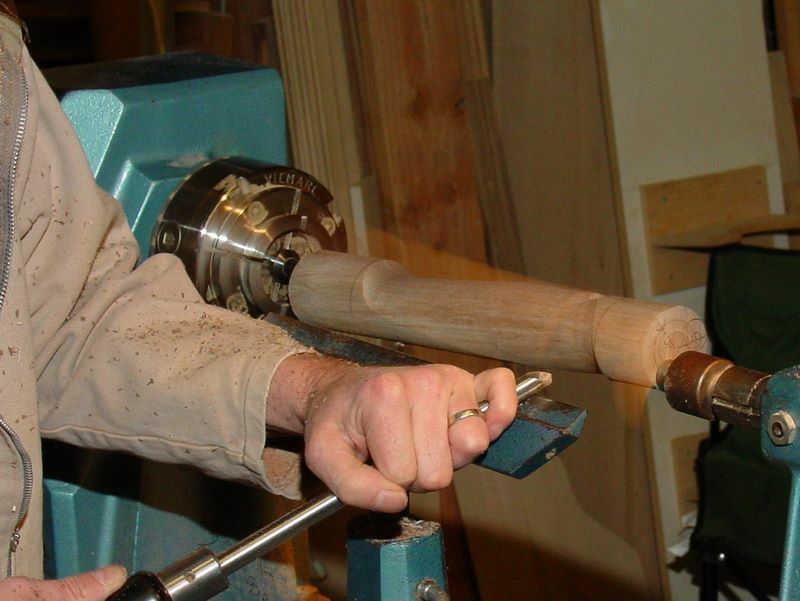 Use a spindle gouge and/or a skew to remove the tenon. Sand as required.